And it’s ridiculously cute. See? Hopefully it won’t be too long before I can post pictures of it encompassing the head of a baby. 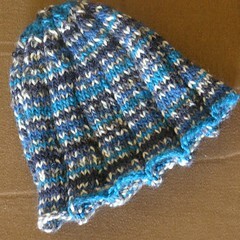 I had to make up my own pattern to get exactly what I wanted, and it wasn’t that hard to do! (As any accomplished knitter…could have told you.) I’m very proud of it, though, because it means that I’m getting better at the knitting, and the knitting patterns, and the knitting pattern writing. Which is fun. 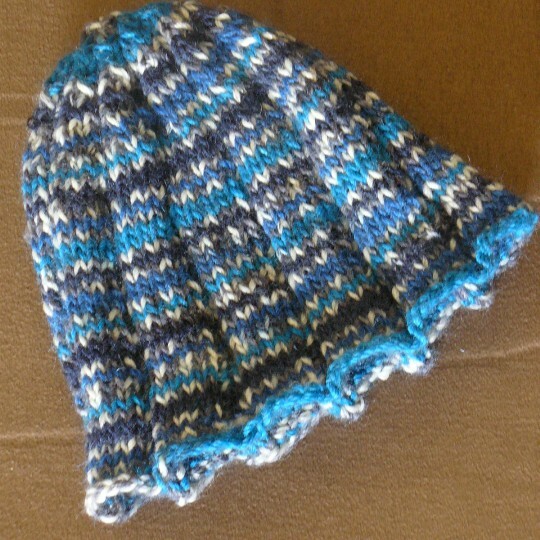 Knit your own Magic Stripes Ribbed Newborn hat, using the pattern here! It is ridiculously cute! I’ll have to borrow that pattern…a friend of mine is the local coordinator for Caps for Kids in her area, and I’m making a batch of baby hats to hand over when I see her next weekend. And I have Magic Stripes! Imagine! Those socks are adorable too! That hat is adorable. I love how it looks with the magical stripes. Can’t wait to see it on the baby. It’s a real hat all right! very sweet, yay!